Dividends are payments made by a company to their shareholders and these payments are paid out of the profits made during the year. Dividend yields are returns from dividends, which can be calculated by dividing the dividend per share by the current market price of the stock. For e.g., a company quoting at 200, declares a dividend of 10, the dividend yield works out to 5%. High dividend yield stocks are for those investors who are looking for regular income as well as capital appreciation over a longer period of time. These stocks can be picked up during market down trend or when market trend is not clear. 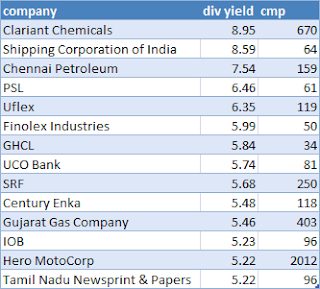 In a downtrend, dividend yields of such companies goes up as the stock prices fall. Before investing in companies that provide high dividend yields, care to be taken that these companies have sound fundamentals, regular dividend paying and enjoy healthy cash flows. 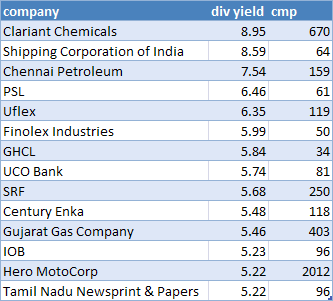 We have picked few stocks which have high dividend yields in the range of 6-9% and with a low P/E ratio. Though the earnings growth of these companies may not be among the highest in the industry, they manage to deliver good results across business and economic cycles. During this time of the year, the companies declare their annual results and dividends. Hence, before investing in these companies, watch out for their annual results and performances as well. The stocks that are picked have been limited to CNX 500 Index and of course, there are few other stocks outside this index with better yields also. While investing in the above stocks, an investor should limit their exposure to about 15-20% of their portfolio, since dividend-investing alone should not be anyone's investing strategy. If you find any other such high dividend yielding stock which might have missed our attention, please inform us or post them in the comment section. The details you showed about dividends is commendable. I learned a lot with the facts that you presented.A company should look closely with the dividend because it's important to keep track with it for the sake of the company's financing records. yes, only this year most of the PSU stocks have paid higher dividends( as they have been asked to do so). One has to wait and see whether this would be regular every year. High dividend yield stocks consistently pay a high dividend yield. Here I would like to share one of the stocks that have high dividend yield that is AT&T Inc. this is a multinational company that provides telecommunication services to the consumers of United States and other countries. Its currently dividend yield is 4.90% for March 2013.